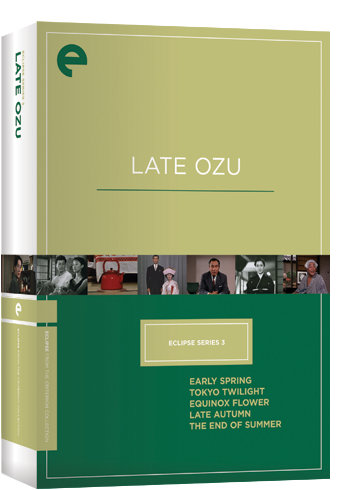 Having enjoyed EQUINOX FLOWER (1958) very much a few days ago, I returned to my new Late Ozu Criterion Eclipse set to watch LATE AUTUMN, another Japanese movie directed by Yasujiro Ozu. LATE AUTUMN, called AKIBIYORI in Japan, is a lovely film which is apparently somewhat a remake of the director's earlier film LATE SPRING (1949). 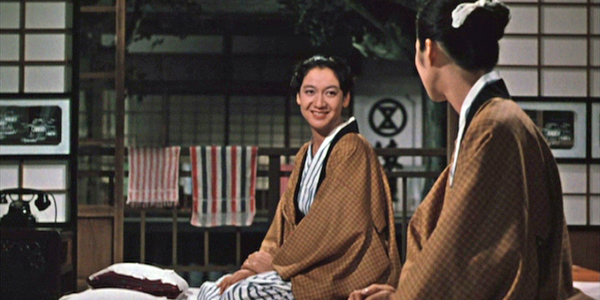 It concerns a young lady, Ayako (Yoko Tsukasa), who is reluctant to leave her widowed mother Akiko (Setsuko Hara) for marriage to an eligible young man (Keiji Sada). Three old friends of Ayako's late father (Shin Saburi, Ryuji Kita, and Nobuo Nakamura) form an ersatz trio of fairy godfathers as they plot the future happiness of both mother and daughter, with sometimes unexpected results. Also figuring into the mix is Ayako's Westernized, outspoken friend Yukiko (Mariko Okada), who steps in when it seems the three gentlemen have blundered. Like EQUINOX FLOWER, I found this film tremendously entertaining and refreshingly different. Both films are calm and soothing, with an unhurried pace and beautiful vistas and music, yet they can also be quite funny. A sequence where Yukiko confronts the three men and then takes them to her family restaurant is delightful, especially when she tells them they're "peachy," to their great amusement. 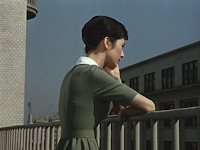 There are also moments of great poignance, never more so than in the film's final shot of Akiko, as so many different emotions pass over her face -- happiness, loneliness, and nostalgia for her own lost love are all there. There is a fair amount of similarity to EQUINOX FLOWER and LATE AUTUMN, as they meditate on parent-child relationships, marriage, changing traditions, and the passing of time. The push and pull between old ways of doing things and a more modern, Westernized lifestyle is just one of the interesting aspects of both films. Based on what I've read about Ozu's other films, I'll be seeing these themes again as I continue to watch his movies. The director seems to have something of a stock company, as many of the actors -- including all four of the most prominent male actors -- were also in EQUINOX FLOWER. For that matter, I think Shin Saburi's character had the very same office in both films, which was amusing. The exterior of the Luna Bar even makes another appearance in this film. LATE AUTUMN runs 129 minutes. Like EQUINOX FLOWER, it was filmed in color by Yuharu Atsuta. I love the film's color palette and the sudden big pops of color from a car, a telephone, or a teapot. A great change of pace, very much enjoyed. 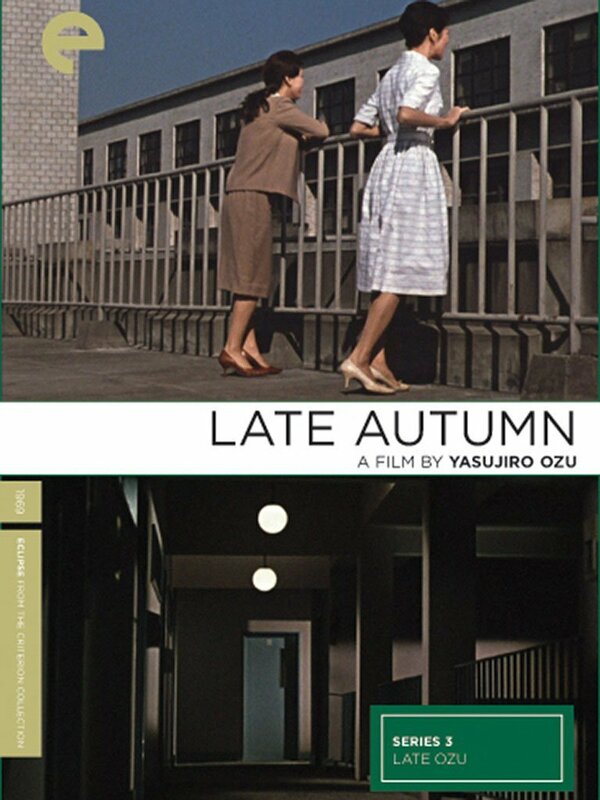 I'm looking forward to continuing to get to know Ozu's work in the months to come. This is the last one I watched, maybe a month ago or so. It is indeed very beautiful and true. These themes do have variations through many late Ozu movies (definitely not all of them--some treat different subjects just as well) though they never get stale. 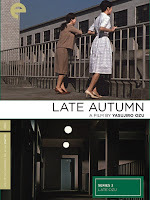 I'd clarify that it is the similarly titled AN AUTUMN AFTERNOON, Ozu's last film, that is really the remake of LATE SPRING, as both movies involve a father and adult daughter. Here it is a mother and adult daughter, a different dynamic, though the story does run along a similar line. It's nice to think of you enjoying these. When you get through the Eclipse set I'm guessing you'll want to go on and will end up in the heady reaches of TOKYO STORY which has what may be the best dialogue exchange of all time. It's between two women in a key scene--I won't say more. Those who know the movie know what I'm referring to. I saw this at Film Forum in New York recently. Excellent film, excellent review. Thank you both so much for your comments -- getting to know Ozu has been a real pleasure thus far and I'm certainly looking forward to seeing more of his films. Blake, I appreciate very much you sharing your knowledge of an area of film which is completely new to me. I'm saving your notes for reference!